Purchasing a bicycle can be difficult, as an individual needs to find a product that best suits their needs. However, buying a used bicycle adds another layer of complexity to the process. It is impossible to know what the prior owner used the bicycle for, and it may be difficult to tell what condition the bicycle is in. A used bicycle can have a pristine paintjob and polished chrome, but that doesn’t indicate the operating condition of the bicycle. If some of the mechanical components such as the brakes or gears are damaged, it is evident that the bicycle has not been well maintained and could be unsafe to ride. Here we will describe some actions you can do to determine if a used bicycle is comfortable, functional and safe. When purchasing a bicycle, you want to confirm that it is the right size for you. 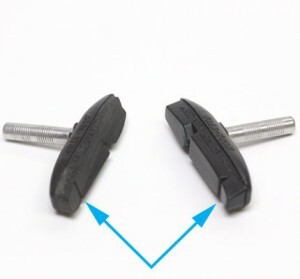 Ideally the saddle should come just slightly above your hip and when you pedal you should be able to almost completely extend your leg at the bottom of your stroke. Before you ride a bicycle, adjust the saddle and handlebars to ensure comfort and proper posture. 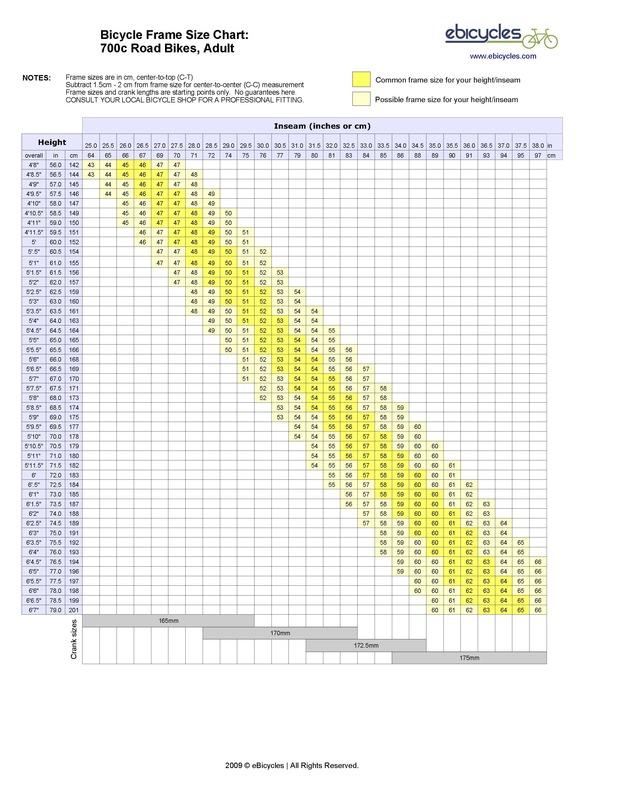 The general rule of thumb is that when you straddle the top tube of a bicycle you should have an inch or so clearance for road bicycles, 3-4 inches for mountain bicycles and 2-3 inches for hybrids [i]. 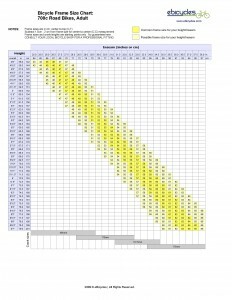 We have included a picture of a size chart for a road bicycle, additional size charts can be found at ebicycles.com. After finding a used bicycle, you want to make sure that it is safe to ride. Examine the bicycle thoroughly and look for potential deficiencies. Below we will describe a variety of mechanical issues a bicycle may have and how you can identify them. When looking at the frame, check for signs of cracking. 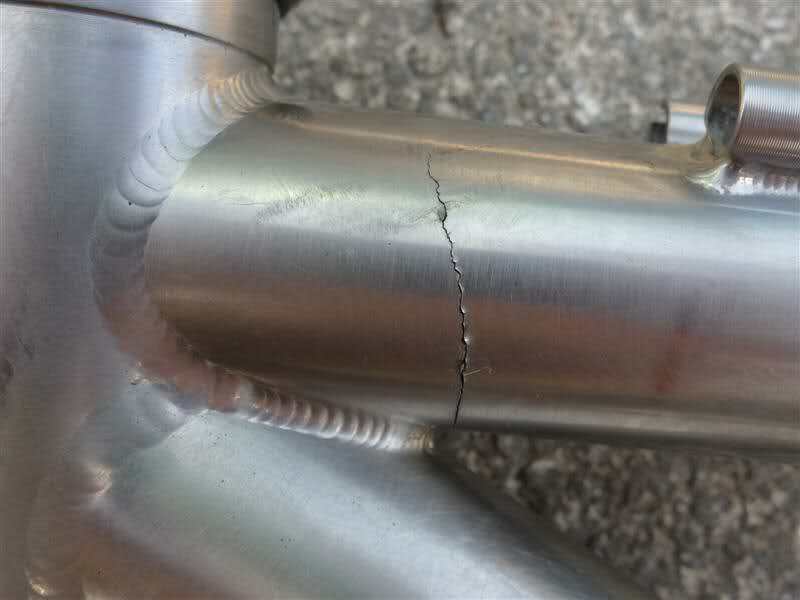 If a bicycle frame has significant cracking, the structure of the bicycle isn’t sound and it could fall apart. You should be mindful of the handlebars as well. Make sure that they aren’t rusty, as handlebars can snap or lock up if in poor condition. Try putting the front wheel between your feet and moving the handlebars. If there is light resistance or the bicycle locks up, it indicates that the handlebars are in poor condition and that the bicycle could be unsafe [ii]. Next, look at the wheels and see if they run true. If the bicycle has loose spokes or the wheels wobble when spun, then the wheels likely need truing [iii]. Finally, see if the tires are properly inflated and see if they are fraying or balding. 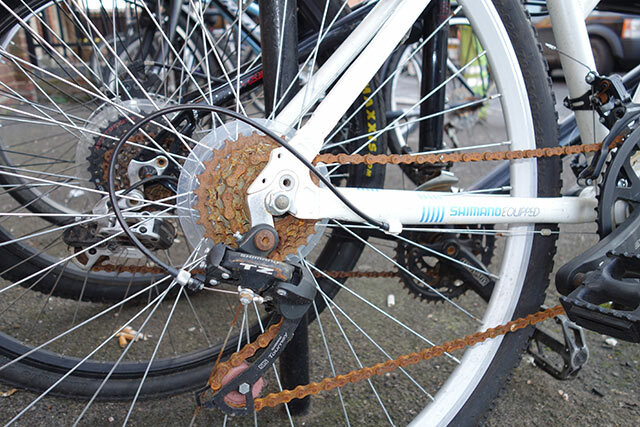 Make sure the bicycle chain isn’t rusted, as significant rust will make it difficult to ride the bicycle. When you look at the chain you should also verify that it does not come cleanly off the teeth. 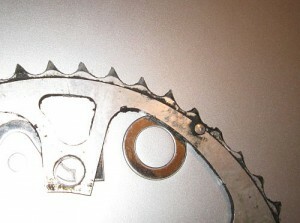 If it does, it means that the chain is worn and the gears can potentially be damaged as well. Examine the chain wheel and sprockets and see if they have a shark-fin like appearance. If they look like this, reject the bicycle, it could signal that there are significant problems with the bicycle’s drive-train [iv]. 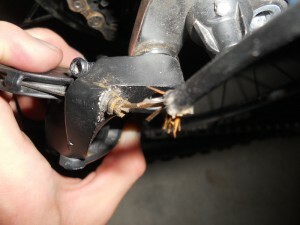 Look at the brake and shifter cables and determine if they are well maintained or if they are frayed. If the cables are in poor condition, there could be damage to the braking or shifting mechanisms. Also make sure that the pads aren’t worn down and that they aren’t seizing up. Be sure you try the brakes on the bicycle and make sure that they work effectively before you move at high speeds. It is also beneficial if the bicycle has reflective surfaces. While they aren’t necessary for the bicycle to function, they offer the rider improved safety at night. After you purchase your bicycle it is recommended to add reflective surfaces to it if they are lacking as well as affix a light to the front and back of the bicycle. You also want to test ride the bicycle before you buy it. You may have missed something while you were examining the bicycle and the quickest way to get a feel for the bicycle is to ride it. Evaluating a bicycle can be a challenging task, as many unsafe bicycles look fine at first glance. When looking at a used bicycle remember to examine it critically and ensure that it is safe to ride. Posted on November 8, 2016 January 17, 2017 by njwalksnbikesPosted in Bicyclist and Pedestrian SafetyTagged recycle, safety, used bikes.